The cutting edge of solar energy research is almost hard to believe: solar windows, nanomaterials that create microscopic solar cells, and even the mimicry of photosynthesis in the lab. Not all of this (or even a fraction of this) will likely make it out of the lab, but it’s still interesting stuff, and gives us a glimpse of where the future is heading. Scientists have discovered that storing solar energy in biological waste from pulp mills might be viable. They found that energy could be transferred to and then stored in the carbon rings present in the brown liquor. The breakthrough aims to provide the world with a more intelligent way to store energy. Read more. The use of dye-sensitized solar cells could provide significant cost savings when compared with standard solar panels. Die-sensitized solar cells are solar cells that use a thin film of low-cost organic dyes and nanoparticles–as opposed to expensive solar cells. 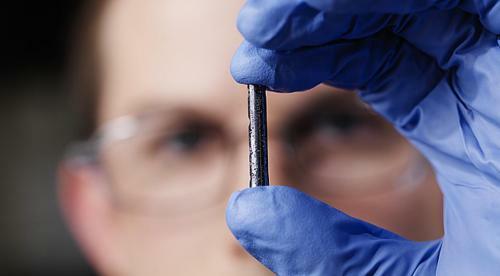 The nano-particles are titanium dioxide nanotubes that act as transparent electrodes. Read more. Engineers are setting new records in converting solar energy into electricity. With the use of tandem polymer solar cells, they have been able to absorb and covert sunlight with photovoltaic solar cells at a rate of 10.6% – a new record. By building a tandem device with a new structure, and incorporating cheaper organic materials, experts have enhanced the performance of polymer solar cells that are now flexible, light, and cheap. This breakthrough has provided an effective way to harvest solar radiation. Read more. 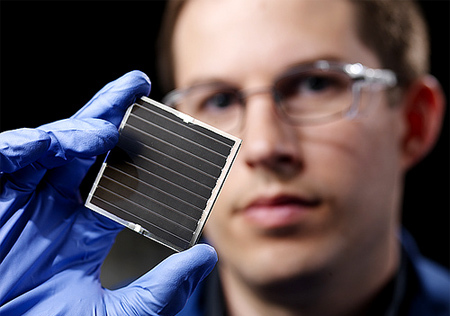 Thin-film solar cells have become a new major focus of research. In comparison to conventional solar cells, thin-film cells’ light absorbing layers are 100 times smaller, are flexible, and easy to mount on a variety of surfaces.This research aims to develop solar panels that can be used in different situations when compared to traditional solar panels. Researchers have developed a transparent “solar window” that you can see through even while it produces electricity. Although it may nay not be as efficient as the commercial silicon-based solar cells, it could certainly have some interesting uses. Read more about the solar window.